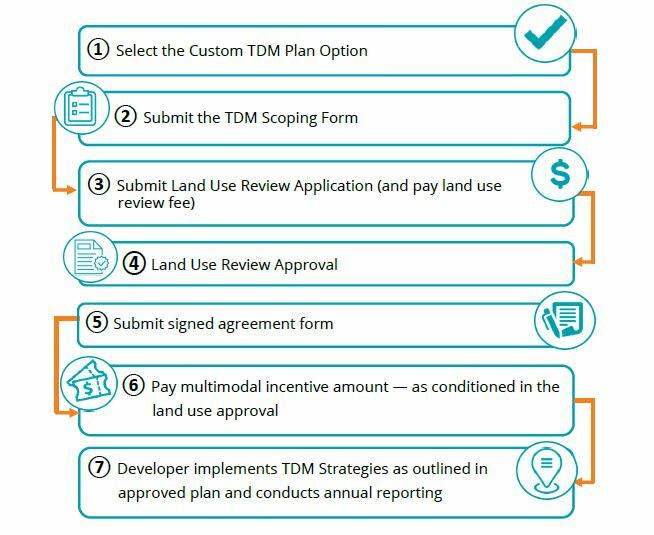 An applicant has two options to fulfill the Transportation Demand Management (TDM) requirement under 33.266.410; a Custom TDM Plan (land use review) or a Pre-Approved TDM Plan (an administrative process). The Custom TDM Plan requires the applicant to go through a Transportation Impact Review (TIR) process as outlined in Title 33.852. Per the requirements listed under 33.852.105.H and 17.107.020, an applicant is required to develop a TDM Plan, get it approved based on the land use approval criteria, and then implement the approved TDM strategies at building occupancy. The following are information and examples of TDM strategies and plans from other cities. These are meant to act as a potential resources for developing Custom TDM Plans, however there may be strategies in these resources that are not approved TDM strategies by PBOT.